Why Is A Seahorse Shaped Like A Horse? Almost every species of seahorse has a few things in common. They have horse-like snouts. They swim with their bodies angled perpendicular to the sea floor. They have prehensile tails. And they look utterly improbable in the battle for survival in the ocean. 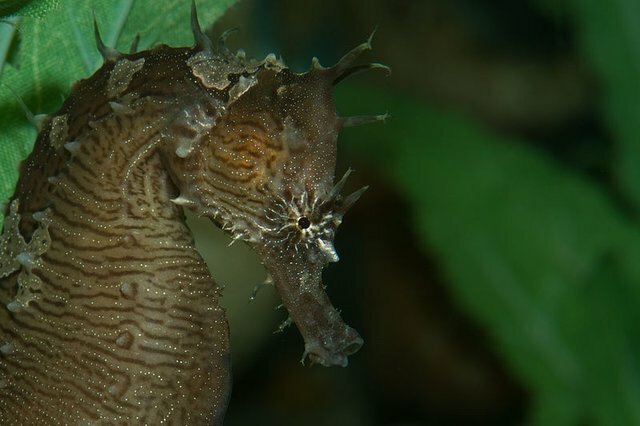 And yet a new study from the University of Texas at Austin has found that not only is the seahorse perfectly adapted for its particular lifestyle, but it's actually an amazing hunter. Seahorses eat copepods, teeny little shrimp-like crustaceans that move incredibly quickly. Copepods are tough to catch; they're very attuned to the movement of the water around them, and if they decide to escape, can easily outswim a seahorse. Except they hardly ever do. The scientists could deduce how [the seahorses] made the water flow around them in three dimensions. They found that the water around the seahorse snout barely moves while the hunter approaches its victims, helping the seahorse to close in undetected. The seahorse appears to achieve this stealth by virtue of how its mouth is located at the end of a long snout. "This gives its head a narrow shape," Gemmell said. "This is the same reason why ships and boats have triangular-shaped bows - it makes it easier for them to move through fluid, results in less drag and disturbance." If the seahorse had a blunter face, it would displace too much water as it slowly inches towards its prey. And once it's near? Well, check out this video. We especially love this video because it changes the way we see seahorses--not just as jewel-like, impossibly delicate creatures clutching with their tails to sprigs of seaweed. They're not just decorative baubles: they're highly specialized hunters, with a whopping 90 percent success rate when pouncing. That makes them much more effective hunters than, say, a lion. Amazing!